Posted on June 24, 2012 by Sofie L.
The Triassic-Jurassic transition of Scania has been one of my favourite research subjects since I was a student back in the late 1980ies. Back then I once again came in touch with the sedimentary rock escarpments of my hometown when working on two small research projects. I got to revisit slopes and outcrops where I used to play as a child, weathered but beautiful and home to bats and various spiders and various insects. Far from a safe playground but as kids, we loved the “wild” sanctuary within the city. Maybe that is where I first fell in love with geology? If I had known back then when I was a kid, what creatures had actually roamed my “hometown area” during the latest Triassic, Rhaetian, I would probably have been even more fascinated by those rocks. But back then, fossils and dinosaurs was not common knowledge. Eventhough the Rhaetian and Hettangian (earliest Jurassic) sedimentary rocks of Scania have been extensively quarried for coals and clays during many centuries, no dinosaur fossil bones have ever been recovered. 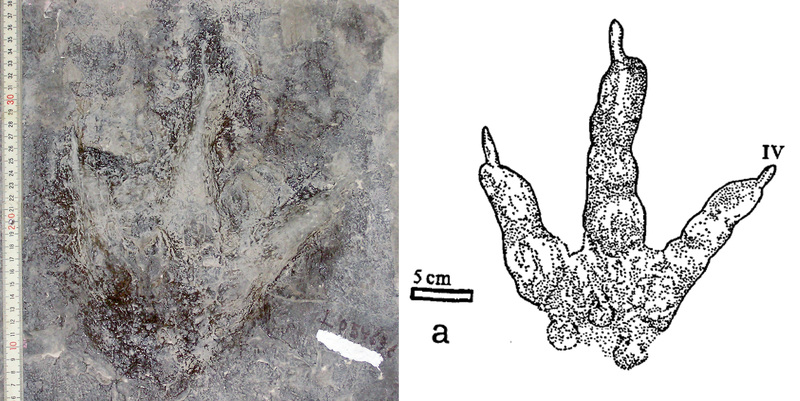 But dinosaur trace fossils of the ichnogenus Grallator have been recovered at several localities, see e.g. Gierlinski and Ahlberg 1994. In this paper the authors describe two different Grallator ichnospecies from various localities in NW Scania. The larger Grallator sp. cf. giganteus, which measures 32 cm in length, and the smaller 15-26 cm long Grallator soltykovensis. Grallator soltykovensis (LO5463t) from the uppermost Rhaetian at southern Vallåkra. Photograph of original housed at the Department of Geology, Lund University. Drawing of the same specimen from Gierlinski and Ahlberg (1994). To date, the Scanian Grallator-trackmakers are unidentified. The Scanian Grallator tracks were defintely made by biped dinosaurs and display between three and four digits, three pointed forward and one backwards. The presence of many tracks of various size (between 15 and 35 cm in length) at southern Vallåkra (no longer exposed outcrop) suggest they were left by a herd, or pack if they were carnivors, of juvenile and adult individuals (Gierlinski and Ahlberg, 1994). My own research on dating the Triassic-Jurassic boundary (by palynology) sediments clearly shows that the tracks were all made during the Rhaetian. Hence, we do not know if the dinosaur-taxa that left these tracks survived the end-Triassic mass extinction event. Hopefully one day someone will recover the fossil bones of the dinosaurs that left these amazing tracks and roamed the latest Triassic Scanian landscape. This entry was posted in dinosaurs, end-Triassic mass extinction, trace fossils, Triassic, Uncategorized, vertebrate palaeontology and tagged dinosaur tracks, Grallator, Rhaetian, Scania by Sofie L.. Bookmark the permalink.